Welcome to Vila Kyme, a lovingly restored farmhouse turned into a lavish 3-bedroom villa that overlooks the rugged Italian landscape and the Adriatic Sea on the horizon, situated in Apulia, the heel of Italy. Built among the olive groves that roll down to the coast, Kyme is a two-storey farmhouse conversion that combines the old blockwork and architecture of the former structure with modern and fresh aesthetic, resulting in a villa that encapsulates the rich history of Italy’s agrarian customs, while providing all of the comforts and privacy of a luxury villa. Whitewashed walls and utilitarian structure on the outside give way to expertly crafted masonry on the inside, supported with vaulted ceilings that are visible through the property. A combination of hilly countryside and gorgeous sea views give the esteemed guests of Villa Kyme a spectacular vista that is second to none. To the rear, a swimming pool that’s surrounded by the walls of the villa is the perfect spot to take a dip into cool waters in utter privacy, with nothing but the blue sky overhead. Sunbeds are dotted around the pool edge, as well as several areas to sit and take shade, including a table and chairs that leave no excuse to enjoy al fresco meals, prepared with local produce and boasting exquisite flavor. Inside, the cool interior afforded by the villa makes for a welcoming refuge after spending time in the hot sun. Beneath the vaulted ceilings, the rooms contain stylish bespoke décor, antique pieces of beautifully carved furniture mixed with more contemporary styled installations, all contributing towards the unique character of the villa, that of the old world meeting the new. A fireplace lies at the heart of the lounge, plush couches and comfortable wicker chairs sat around it; the crackling flames in the wide hearth creates a cozy spot to sit beside with a book in hand for the cooler evenings. A fully equipped kitchen sits at the ready, filled with state-of-the-art appliances and industrial grade stainless steel cabinetry to make an efficient preparation area, and aids guests in the preparation of richly flavoured and mouth-watering meals. Clean white walls and a lofty arch overhead makes the kitchen one of the brightest in the house, as a wide-arched patio door also provides direct access to the courtyard outside, an ideal spot for a morning coffee or evening glass of wine. Several dining options are available to guests; the dining table with seating for eight sits adjacent to the kitchen with gorgeous views of the gardens that surround the villa, whereas the shaded terrace holds a table and chairs right next to the pool area, the ambience of the Italian countryside accompanying your meals. The villa’s rustic charm extends into the bedrooms, with lavish linens dressing the bed; sinking into slumber is a joy at the end of each day, with the guarantee of waking up totally refreshed upon waking. Clean white walls and a monochrome colour palette instill a sense of calm and relaxation, in order to unwind the mind and relax the body. Two bedrooms hosting queen-size beds, one with an extra trundle bed suitable for children, are on the ground floor. Direct access to the courtyard is afforded to the two ground floor bedrooms. The Master bedroom is located upstairs on the first floor, equipped with a luxurious king-size bed, sitting room and study. All rooms are equipped with their own en-suite bathroom with walk-in shower. Located in the Puglia Region in the heel of Italy, which claims the prestige of having the longest coastline of any mainland region of Italy, Villa Kyme overlooks the Adriatic Sea. 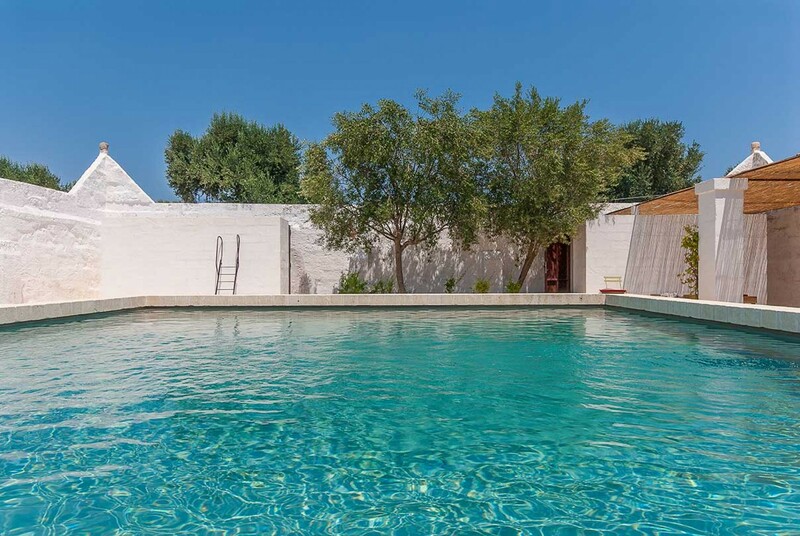 Residing near the town of Ostuni, the villa maintains a distance from the public to ensure privacy and security for the duration of their stay. Its proximity to the town allows for easy access to shops and restaurants, as well as nearby beach access; further afield, the gently sloping landscape of the least mountainous region of Italy is littered with a plethora of historic landmarks and influential architecture across the country. Further down the heel of Italy, Lecce (84.3km), a historic city that bears the moniker of “Florence of the South” for its baroque styled buildings and architecture, and Brindisi (45km), the ancient “gateway to the East” are chock full of things to see and do, with many features still left from ancient times.